Japan's Legend Toys is the latest contender to jump head first into the Steve Jobs action figure game—an arena where many others have failed to ship once Apple issued an official cease and desist order that shut production down. This new eerily lifelike 12-inch Steve Jobs action figure comes complete with glasses, three pairs of hands, a small sofa and a red apple—priced at $199 each which includes shipping. The ability to Pre-Order has already been opened on the Legend Toys website. So how do you know this is not an elaborate ruse to grab some quick cash and then never deliver a Steve Jobs action figure or issue a refund should Apple's legal team succeed in shutting sales down before shipping? You don't. That's the bad news. Lesser detailed Steve Jobs figures from China originally priced at $79 each—sold on Ebay for $2,500 after Apple shut the operation down in 2010. The risk versus reward here could be significant. Good luck with that. A little known feature that can be included into your iPhone Contacts is teaching Siri to pronounce names correctly by adding a Phonetic spelling Field for first name and last name. Siri can be totally insensitive by constantly mispronouncing the names of friends and family like a mindless turd. The "Add Field" Phonetic spelling is a simple fix for this problem, even though it will take some experimentation to get it right. Tap the Contacts icon on your iPhone > then select the Contact you want to add Phonetic Spelling to. Tap on Edit in the upper right > Scroll down to the bottom of the page to Add Field and select Phonetic Last Name or Phonetic First name (or both if you choose). You can now fill in the field with Phonetic Spelling and then put Miss Siri to the test until you get it spot on. My last name is Basile — so after trying several Phonetic variations I settled on (Bus-illy) which is far better than Siri has ever pronounced it when left on her own. You'll also notice that the Add Field in Contacts lets you include a nickname or middle name, a Twitter handle and several other useful fields you may not have known were available until now. Good luck with that. Access Siri anytime by holding down your home button — even directly from sleep mode. Step One: remove your new hard drive from packaging — Step Two: snap hard drive onto your iPhone 4 or 4S — Step Three: enjoy the endless moments of awesomeness. Perpetual Kid is featuring this Hard Drive iPhone Case complete with obligatory barcodes for $13 — it just doesn't get any more geek or dork than that on the cheap. It's the only computer nerd bait you'll ever need if your a geeky girl looking to snag yourself one of them big brain fellas. Overwhelming feelings of happy, happy, joy, joy come free upon delivery. iPhone texting on-the-go has never looked so awkward until you add a Grande latte on board. A Dutch marketing company has set out to design the first cupholder case for iPhone — they call it Uppercup. Most of us know how difficult it is trying to sip that morning coffee and text at the same time while standing in a crowded subway station or waiting for the bus. The revolutionary Uppercup is about to change all that forever. Woohoo! The designers are hoping to crowdsource their $25,000 in funding requirements so they can get their iPhone cup holder concept into production. The lightweight Uppercup case will cost $30 dollars for iPhone 4 and $35 for iPhone 5 — if you want to dive in with the other 7 backers. Now you can use the iPhone-friendly Brolly Umbrella paired with an Uppercup for drinking coffee and texting while standing in the rain. Jackpot! 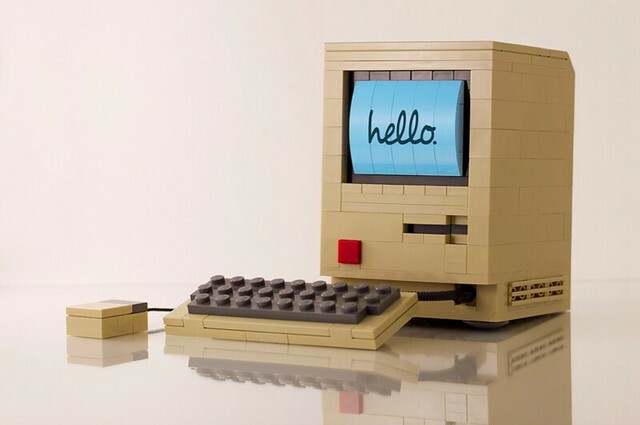 This ingenious rendition of Apple's original Macintosh ad was created by photographer Chris McVeigh (aka) PowerPig — who has churned out some pretty amazing Lego concepts in the past. His latest original design could be the Mac Daddy of them all (pun intended). I only wish that Lego actually made sets like this one. I'm sure a bazillion other Mac faithful have that same wish. You should compare this Lego replica to the original ad. The company also announced that Alicia Keys has joined the team to pimp the handset in her new role as as their Global Creative Director. Miss Keys will be working closely with app developers, content creators and retailers to enhance entertainment consumption and distribution, according to Blackberry. “Alicia Keys has come to BlackBerry because she believes in the product and technology, and subscribes to our overriding philosophy to ‘Keep Moving’: to empower people through mobile computing and communications,” said BlackBerry President and CEO Thorsten Heins. Just hours after the San Francisco 49ers locked in their path to Super Bowl XLVII, artist Scott Freeland quickly began churning out a championship model of his iRetrofone dock to celebrate the big win. Woohoo! His Super Bowl inspired iPhone charging dock is equal parts foolish and functional fan art all rolled up into one. Come on man! — does anybody really want to plunk down $250 for a 49ers themed iPhone dock? Rather than waiting for the answer to that question — Freeland chose to knock out a Baltimore Ravens version of his footballer dock as well so no one felt left out. Like linebacker Ray Lewis for example. Scott's latest iRetrofone design leaves enough room to accommodate an iPhone 5 along with a thin case included as well. Once you connect your iPhone into the dock — you'll be able to answer calls with the retro style handset that lets you chat it up like it's 1972 all over again. The hidden opening for your charging cable supports iPhone 3G, 3GS, iPhone 4G, 4S and iPhone 5. Overwhelming feelings of fanatical 49ers fanboy joy comes free upon delivery. Needing to text while out walking in the pouring rain is an unavoidable essential living here in Seattle — the newfangled Brolly Umbrella has now made that annoying little habit a whole lot easier. I can't tell you how many times I've witnessed tourists walking across a busy intersection holding a traditional umbrella while attempting to text. A little breeze kicks up and then blammo! — that umbrella goes flying in one direction along with their iPhone which rockets down the pavement like a damn hockey puck. The Brolly is equipped with an iPhone-friendly grip that is supposedly enhanced for stability with a squeezable comfort-grip material on board. Toss in the compact, wind resistant design that keeps your mobile aqua shelter erect in a storm and you have the perfect geek bait for just $20 bucks. Although I'm not a huge fan of walking and texting — I can see this thing being far more useful for photogrpahy while shooting out in the elements with a smartphone or even an SLR. The fact that you can also use this little knuckle buster for an unplanned street brawl is clearly a bonus. Jackpot!